We collected the majority of metadata history records for Registrar.vassar.edu. 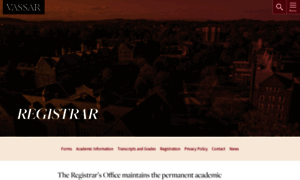 Registrar Vassar has a poor description which rather negatively influences the efficiency of search engines index and hence worsens positions of the domain. We did not detect any description or keywords on Registrar.vassar.